The diesel powered Jet steamer is the extension of our professional and industrial program with an extremely high steam production. 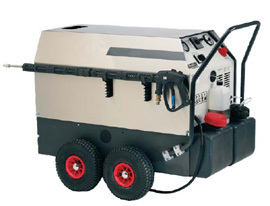 By means of very high steam temperatures and a patented integrated compressed air system these steamcleaners match up to high pressure cleaning and are an alternative to dry-ice blasting! This professional dry steam cleaner has been developed for the highest industrial demand and can be used for cleaning in almost every industrial field. Production machines, robotic systems and other mechanical, electrical, pneumatic or hydraulic installations can be cleaned smoothly and effectively, while being environmentally friendly and cost saving. Because of the minimal water usage, revisions and maintenance jobs on machines can be done on the spot without dismounting and interruption of the production process,	thus ensuring a cost and time saving. Also the high steam pressure, temperature and volume enable a quick cleaning process. The powerful diesel powered Jet steamer has the highest quality level in steam technique. This equipment is fitted with high-quality industrial materials, a strong bodywork, air wheels, advanced electronic control and many practical features, such as an automated water filling system. But especially the patented compressed air system is worth mentioning. This integrated system with the possibility to combine compressed air with steam is a revolutionairy cleaning method. This method with steam, detergent and compressed air is in many cases a cheap alternative for dry-ice blasting! For this machine there is simply no alternative.